Uric Acid is an end product of purine nucleotide catabolism in humans. While uric acid provides health benefits when present at normal levels, abnormally high or low levels can cause adverse health effects. Systemic uric acid concentrations are influenced by dietary levels of purine rich foods, body mass index (BMI), and cardiometabolic risk factors, such as high blood pressure, high density lipoprotein (HDL), triglyceride levels and fasting blood glucose. 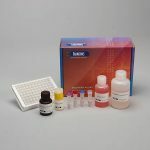 The Salimetrics Uric Acid Enzymatic Assay Kit is a colorimetric assay specifically designed and validated for the quantitative measurement of salivary Uric Acid. It is not intended for diagnostic use. It is intended only for research use in humans and some animals. Salimetrics has not validated this kit for serum or plasma samples. 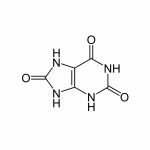 Uric Acid (UA) is an end product of purine nucleotide catabolism in humans that provides health benefits at normal levels, constituting a large portion of the antioxidant capacity of blood. In general, antioxidants are critical in minimizing the systemic physiological stress of free-radical oxygen species on the body preventing a condition known as Oxidative Stress. The cumulative damage caused by Oxidative Stress has been linked to a wide range of health problems including cancer, cardiovascular disease and age related neurodegenerative diseases among others. Therefore, the antioxidant properties of Uric Acid are thought to provide a protective role against these conditions. Consistent with this concept, a recent report indicates that high blood levels of Uric Acid may be protective against Alzheimer diseases. Systemic Uric Acid concentrations are influenced by dietary levels of purine rich foods, body mass index (BMI), and cardiometabolic risk factors, such as high blood pressure, high density lipoprotein (HDL), triglyceride levels and fasting blood glucose. When Uric Acid concentrations are elevated in a condition known as hyperuricemia, significant harmful health effects result. Blood uric levels above 7 mg/dl leads to the formation of monosodium urate (MSU) crystals. After sustained hyperuricemia, these MSU crystals deposit in tendons and joints to cause severe diseases including gout, kidney stones and several forms of kidney disease. Gout is the most prevalent inflammatory arthritis worldwide and frequent monitoring of Uric Acid levels is critical for disease management. In the case of kidney stones, approximately 5-10% of the 3.3 million Americans seeking medical care for kidney stones are due to elevated Uric Acid. High blood Uric Acid levels are also associated with a wide variety of diseases including hypertension, increased cardiovascular mortality, obesity and metabolic syndrome. Several studies have reported that a linear relationship exists between serum and salivary Uric Acid levels and salivary Uric Acid may be a useful biomarker for monitoring metabolic syndrome that may help mitigate cardiometabolic risk. This method utilizes a proprietary enzymatic reaction mixture that enables the detection of Uric Acid by the production of a red chromogen after a short incubation. This chromogen is quantitatively measured at a wavelength of 520 nm. The amount of Uric Acid in the sample is directly proportional to the increase in absorbance at this wavelength. For ease of use, the reaction is read in a 96-well microtiter plate with standard and controls provided. Riis JL, et al. (2018). The validity, stability, and utility of measuring uric acid in saliva. Biomark Med. 12(6):583-596. Galassi FM, Borghi C. (2015). A brief history of uric acid: From gout to cardiovascular risk factor. Eur J Intern Med, 26(5), 373. Pohanka M. (2014). Alzheimer’s disease and oxidative stress: a review. Curr Med Chem, 21(3), 356-64. Goodman AM, et al. (2016). The hippocampal response to psychosocial stress varies with salivary uric acid level. Neuroscience. 339:396-401. Lu N, Dubreuil M, Zhang Y, Neogi T, Rai SK, Ascherio A, et al. (2016). Gout and the risk of Alzheimer’s disease: a population-based, BMI-matched cohort study. Ann Rheum Dis, 75(3): 547-51. Lippi G, Montagnana M, Franchini M, Favaloro EJ, Targher G. (2008). The paradoxical relationship between serum uric acid and cardiovascular disease. Clin Chim Acta, 392(1-2), 1-7. Soukup M, Biesiada I, Henderson A, Idowu B, Rodeback D, Ridpath L, et al. (2012). Salivary uric acid as a noninvasive biomarker of metabolic syndrome. Diabetol Metab Syndr, 4(1), 14. Xia Y, Peng C, Zhou Z, Cheng P, Sun L, Peng Y, et al. (2012). [Clinical significance of saliva urea, creatinine, and uric acid levels in patients with chronic kidney disease]. Zhong Nan Da Xue Xue Bao Yi Xue Ban, 37(11), 1171-6. Nunes LA, Brenzikofer R, Macedo DV. (2011). Reference intervals for saliva analytes collected by a standardized method in a physically active population. Clin Biochem, 44(17-18), 1440-4. Martínez AD, et al. (2017). Association between body mass index and salivary uric acid among Mexican-origin infants, youth and adults: Gender and developmental differences. Dev Psychobiol. 59(2):225-234. Goll RD, Mookerjee BK. (1978). Correlation of biochemical parameters in serum and saliva in chronic azotemic patients and patients on chronic hemodialysis. J Dial, 2(4), 399-44. Glantzounis GK, Tsimoyiannis EC, Kappas AM, Galaris DA. (2005). Uric acid and oxidative stress. Curr Pharm Des, 11(32), 4145-51. Ames BN, Cathcart R, Schwiers E, Hochstein P. (1981). Uric acid provides an antioxidant defense in humans against oxidant- and radical-caused aging and cancer: a hypothesis. Proc Natl Acad Sci U S A, 78(11):6858-62. Rees F, Hui M, Doherty M. (2014). Optimizing current treatment of gout. Nat Rev Rheumatol, 10(5), 271-83.